Xiaomi Mi 8 White Version Goes on Sale With 3,299 Yuan - Playfuldroid! 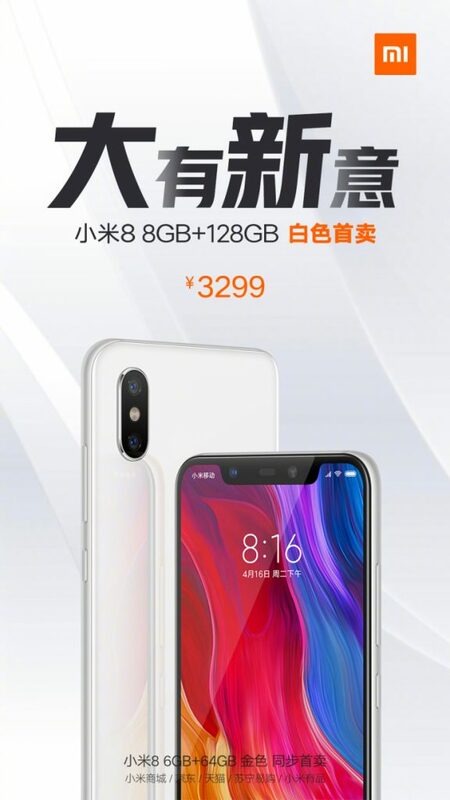 Through Weibo, Xiaomi has confirmed that it will begin the sales of white colored edition of the Xiaomi Mi 8 smartphone for the first time in China starting at 8 PM local time. The handset is now available for buying with a price tag of 3,299 Yuan ($480). The white edition of the Xiaomi Mi 8 comes with an internal storage of 128 GB and it features of 8 GB RAM. Apart the white color option, the Mi 8 is available in the home market in color choices such as black, gold and blue. The Xiaomi Mi 8 features a 6.21-inch IPS LCD display that carries support for Full HD+ resolution. The Snapdragon 845 chipset is present under the hood of the device. It is packed with a 3,400mAh battery that carries support for Quick Charge 4.0. The back panel of the phone is equipped with dual 12-megapixel snappers and at the front is a selfie camera of 20-megapixel. In related news, Xiaomi will be expanding its Mi 8 lineup by launching two new phones on Sept. 19. The Chinese manufacturer will be debuting Xiaomi Mi 8 Youth Edition powered by Snapdragon 710 in the coming week. It is also expected to debut Gold version of Mi 8 Screen Fingerprint Edition alongside Mi 8 Youth Edition.